Are you planning to bring kids on a honeymoon? None of the major reasons to take a honeymoon include spending time with little ones. A honeymoon is intended to be a private time to reflect on your new bond, get used to the idea of being legally married, and make love uninhibitedly. Yet, more and more loving couples who have brought children into the world without first enjoying the benefits of marriage ultimately decide to tie the knot. And they can not imagine going on a honeymoon without those kids. With remarriage, there are often children on one or both sides. So unless a friend, grandparent, or an agreeable ex-spouse is willing to take them off your hands for a few days, you have a choice: Take a honeymoon with the kids or no honeymoon at all. If you're determined to have your time in the sun, these are the optimal options for a family honeymoon. Unencumbered couples get to frolic sensually at adults-only ​Sandals Resorts and others in this category. Couples who honeymoon with kids have a similar option: Sandals' PG-rated Beaches brand of all-inclusive family resorts offer parents many of the same amenities that romantic couples get: Locations along great beaches, multiple restaurants, unlimited food and drinks, golf, water sports, and other activities. The big difference is that children—from newborns to teenagers—are not only welcome but can be kept occupied and out of your hair with supervised, age-appropriate activities from morning until night. And if you're wondering which property to choose, Beaches Turks & Caicos, located on one of the most gorgeous beaches in the Caribbean islands, ​earns top honors. There's also a 45,000 square-foot waterpark and four different villages that replicate the architecture and ambiance of Italy, France, the Caribbean, and Key West at Beaches Turks & Caicos. Activities for everyone, from tots to 'tweens and teens, leave adults free time to have some authentic honeymoon moments. The majority of cruise lines are well-equipped to host families with kids on a honeymoon. Babysitters and counselors work in children's play areas and shallow pools just for kids to ensure that little ones will be occupied and cared for while parents can unwind and indulge in quality alone-time. Although river cruises have traditionally been the favorite of older travelers, one brand is appealing to families with kids: ​AmaWaterways has partnered with Disney to offer selected itineraries and tour guides geared to multi-generational family groups. They're even building new ships with interconnecting rooms so parents and children have direct access without having to change out of their jammies. Hawaii has always been a popular honeymoon destination, and now it is a family destination as well. Couples who traveled to these islands after their own wedding and fell in love with the state returned with kids in tow. Many of Hawaii's hotels responded by offering special services for families with children. With 3,000 rooms in multiple towers, Hilton Hawaiian Village on Waikiki Beach is the largest. Its Camp Penguin for kids ages 5 to 12 immerses them in the culture of Hawaii with stories, games, arts, crafts, and music. They'll learn to hula and make leis while you hit the spa, beach, shops, or your room in blissful peace. This hotel also has a dedicated wedding chapel, so you can have both your wedding and honeymoon here. 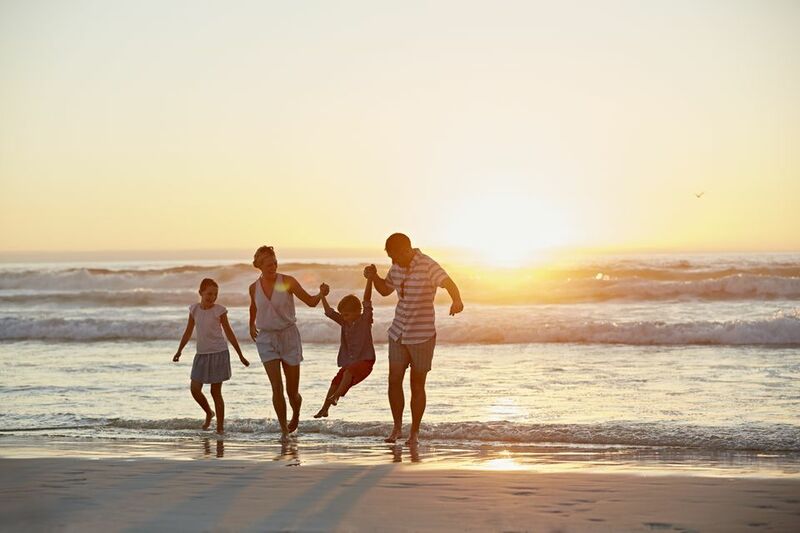 Once the preserve of loving couples and executive business types traveling on the company's dime, many Ritz-Carlton properties ​in sunny resort locations have gone out of their way to cultivate family travel business. Services at Ritz-Carlton hotels for adults on a honeymoon with kids include certified nannies, child-appropriate registration, summer camp sessions in June and July, and a kids' meal plan. At the Ritz-Carlton, Naples in Florida, there's also a virtual-reality games center and a nature center that features an aquarium with multiple programs including critter feeding time and beach-combing for shells. If your kids are school-age and spend far too much time in front of screens, getting them outdoors into one of the U.S. National Parks. These spots will fill them with fresh ideas along with fresh air. Note that because these parks are very popular, especially during school breaks, it's essential to make reservations well in advance to avoid disappointment. If you're kids at heart yourselves, you may get as much of a kick out of Disney World, Epcot, and Universal Studios as youngsters do. But be aware that it won't be a relaxing honeymoon holiday. And even if your kids are well-behaved and patient, there will be others in the crowds who add to the noise and tumult. If you can arrange for a babysitter, reward yourselves by stealing away for a few hours in the evening and indulging in adult pleasures. You've earned it!